We have been in our MWF class for 33 days. 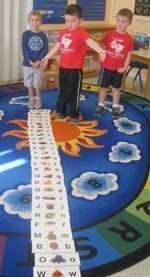 We know this because every day during our circle time we count all the days we have come to school on our School Days Chart. Every morning we arrive and find our personalized shape of the month — this can include our names, our initials, and last names. After placing our shape in the basket noting our attendance, we hang up our coat and bags and then greet our teachers and friends. 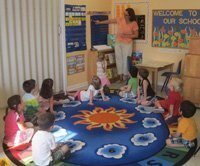 Once everyone has arrived, we find our letter on the rug for circle time. Each week we sit on a new letter. Circle time includes updating our calendar, the weather and our School Days Chart. After this, the leader of the day holds our flag and we practice saying the Pledge of Allegiance. We also sing songs about the days of the week and the months of the year and answer the question of the day. On Mondays during circle time, we introduce our letter of the week with a story which emphasizes that letter. We learn how the letter sounds, how it is formed and create a list of all the words we can think of that start with that letter. On Fridays, we all share an object from home that begins with that letter — this can be a time of discovery. When we did the letter “I”, a child brought in an iron. This led to a discussion on how an iron is used, since the majority of the children had no idea how it was used. We borrowed an ironing board from the class next door and the children enjoyed ironing some of our dress-up items. Also, a word beginning with our letter of the week is introduced and added to our word wall. After circle time, the children are free to explore our classroom and engage in activities that interest them — solving puzzles and manipulatives; building with blocks, Legos and gears; creating at the easel; using play dough; playing at the sand/water table and engaging in dramatic play. During this free time the children have the opportunity to work one-on-one with the teachers on projects and our letter journals. Projects can encompass many areas at once. For example, currently the children are working on Thanksgiving turkey cards that they first cut out (fine-motor skills), then matched the number of dots at the base of each turkey feather to the correct numerals on the turkey’s body (math concepts) and finally created the turkey’s face (art). Our letter of the week is added to our journals only after we have practiced making the letter through stamping it on “Stamp and See” board, writing on the white board and doing “Wet, Dry, Try” on the iPad or with our slate. We write the letter in our journal and add a picture of a word that starts with our letter. Each day we also enjoy our special classes. Monday is Language Arts, Wednesday is Music and Friday is Gym. After specials, it is time to clean up our classroom and our class does a super job. We wash hands and say grace before eating our snack. All of us are learning to use our manners to say “Please” and Thank you” when asking for snacks. After snack, we sit on the rug and look at books alone or with a friend, while we wait for everyone to finish. Then one of our teachers reads us a story before we go to the playground. 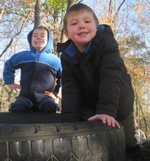 On the playground, some have been learning to climb to the top of the play structures, to balance on the tires, and to swing without being pushed. Throughout our day, we are learning many concepts and skills while we also are observing the world around us. Walking to the playground, we have observed how the leaves have turned from green, to yellow and orange and then brown. Now we can see that the trees are bare and it is getting colder, our clothes are changing as we head into a new season. Our days are extremely busy so we are often surprised when we learn it is time to go home.